The holidays have come and gone, yet the excitement of 2015 remains. What’s our resolution you ask? Be more active with our blog and social channel (you know…cobbler’s children have no shoes)! So with that in mind, we wanted to share one of our more recent case studies, for the Catawba Riverkeeper. Enjoy, and look for more to come! It seems like a no brainer that our friends in Raleigh would work hard to protect our state’s drinking sources. Yet North Carolina has some of the most toxic rivers in the country – many of which supply the drinking water to our major cities and towns. In fact, Charlotte’s main water source, the Catawba River, has been designated as one of America’s most endangered rivers three times, most recently in 2013. One of the biggest threats comes from coal ash ponds, which are leaking toxic pollutants into the ground. And despite a lot of high visibility press about recent coal ash spills and the resulting battle cries from voters for action, legislatures have continually failed to take strong or meaningful steps towards protecting our drinking water. Enter the Catawba Riverkeeper organization, a non-profit that advocates for the health, protection and enjoyment of the Catawba River watershed. The Riverkeeper saw the highly charged political environment of the 2014 elections as the perfect opportunity to educate people about the threats to this key drinking water source, and (hopefully) motivate voters to consider the issue when selecting new elected officials. The Riverkeeper approached Saturday for help with a campaign that would get the word out about the threats to our area’s drinking water reservoirs and motivate people to put pressure on politicians so they might consider our water sources as a top priority, once elected. It was important that the campaign remain politically neutral – after all, this is an issue that affects everyone. However, one thing we had to keep in mind was the way different politically-inclined people approach the issue is diverse. While families and left-wing types seem to worry about toxins and their children’s toxins exposure, the farther right-leaning and generally older crowd is concerned about conservation and property values. Armed with these insights, we hit the ground running and quickly developed an attention-grabbing campaign that brought the issue forward in an un-ignorable way. 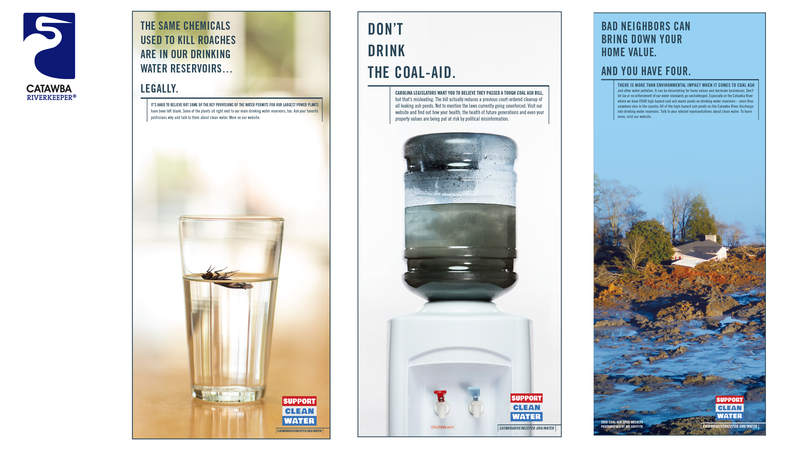 From a dead roach in a water glass, to a water cooler filled with coal ash, each of our three ad concepts presented the issue from a different angle, to ensure the campaign would resonate, regardless of the reader’s political affiliation. The campaign had an immediate impact, with several news stations running stories about one of our ads. Social media also played a key role in the overall success of the campaign. 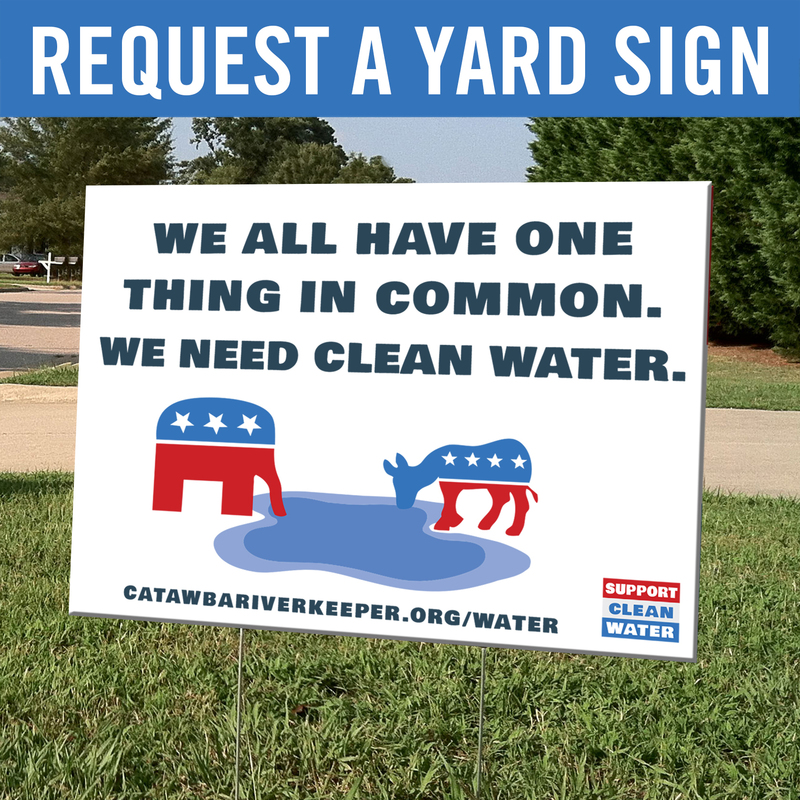 Within two weeks, the Catawba Riverkeeper’s Facebook page had gained 236 likes, compared to just 16 gained in the previous month (a 1,375% increase). Additionally, our promoted posts saw the highest levels of engagement ever on the page, with spikes around the roach ads and videos. The roach video we created on-the-fly to leverage the success of the print, had a total reach of over 55,000 people, garnering 202 likes, 121 shares, 18 comments, 918 link clicks, 756 video plays and 43 page likes. 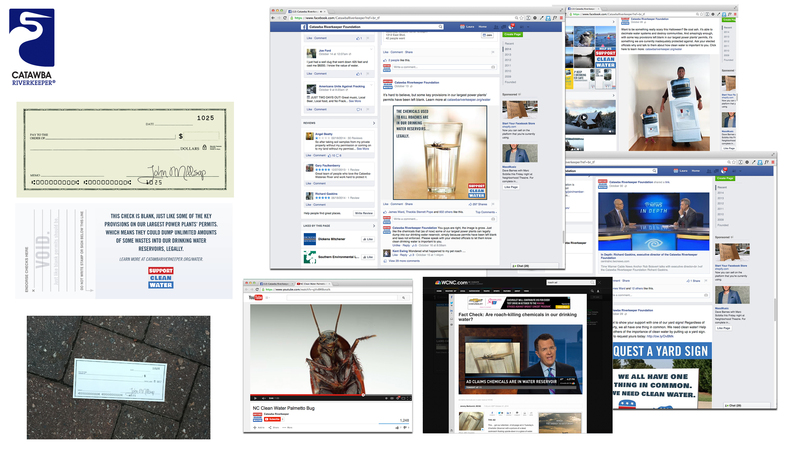 Our other posts averaged between 300 – 500 likes per post and each had over 200 shares. We’re proud to have moved the needle for such a great cause and so honored to have worked with the such a great client. So next time you have a glass of clean water, join us in raising it and toasting the Catawba Riverkeeper Organization. Cheers.